Let’s face it, there isn’t a huge amount of choice when looking to purchase a UID Verifier. 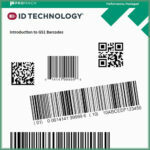 I’ve always liked the handheld UID Verifier made by our friends at Cognex, but not the desktop version – I’ve tended to stick with the RVSI/Siemens/Microscan verifier for most of our labeling jobs. To bring the verifier line up to date, Cognex recently launched the new Dataman 100 MkII verifier, designed to be more flexible than the older version. As well as AIM DPM (the only verification standard supported by the original verifier) the 100 MkII can also verify against the ISO 15415 and AS 9132 standards. Lighting is improved as well, allowing the Dataman 100 MkII to be used for direct part mark verification as well as for labels and dataplates.The system can either be used as a fixed mount unit or can be provided with an adjustable stand to allow a range of different products to be verified. As you can see in the photo, the optional adjustable stand makes this a nice solution for DPM verification. I’ve not yet had the chance to test one out, so I’m not sure how it will work for verifying labels – hopefully we will see one here in the near future. It will be really interesting to compare the new Cognex verifier with our Microscan one. Are you a DoD contractor with a need to verify UID labels for MIL-STD-130? Which system do you prefer? Want to learn more? Call me at 603-598-1553 x237 or use the contact form on the site.